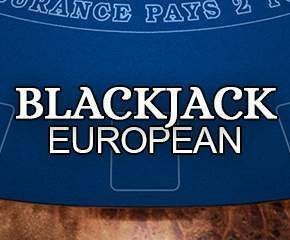 European Blackjack comes with six decks of fifty-two cards each in this game and the cards are shuffled after each game. The game is set on a teal blue table with decks of cards on one side and bettings chips below. To make the game more exciting, there is a nice music given in the background too. You can play with five hands in this game and all of them allow you to win simultaneously. The limits to place bets are between £1 and £500 per hand. So with all five hands, you can wager £2500 in one shot and win big if you are lucky. This variant of a Blackjack game with multiple hands and amazing features was developed by Realistic. A gaming company with rich experience of creating over 250 games from various different categories. They are listed among world’s ten best casino games developers. European Blackjack is played with five hands and you can play all five or any number of hands as per your preference. The five hands give you the benefit of identifying a stronger and weaker position. Based on this stats you can adjust your betting accordingly. To win, you must score 21 points from the first two cards or any points closer to 21 than the dealer. If you cross 21 you will get BUST and lose the hand. The dealer cannot draw cards once he reaches 17 and this is where you can take advantage as you are allowed draw even at this stage. There are options such as insurance, split and double to help you make enhanced wins. Split Hands: You will be able to split all the hands with the initial two cards having identical numbers or values. So apart from the game’s five main hands, you will be able to play additional hands with this option. The betting limits and rules for these hands remains the same. Insurance: You will be able to buy this at a cost of 50% on your bet. The benefit to you here is, you will get paid two to one if the dealer gets a BJ hand. If not, the European Blackjack game continues as normal but you cannot get the fee amount back. European Blackjack is a game played with five hands that help you play more number of hands per hour. So you will have increased chances of winning better.